I created this rubric for our kindergarten team. We recently changed to a standards based report card that rates students' progress towards the standards on a 1-4 scale. 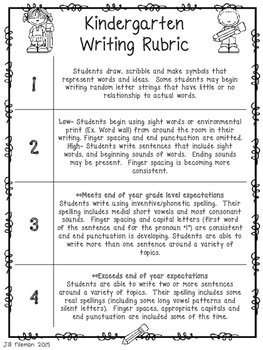 **Just updated with two versions: ascending and descending numbers on the rubric. 3= Met end of year grade level expectations. 4= Exceeds grade level expectations. To be clear, according to our district a student can only score a 3 if they have currently mastered end of year expectations in writing. A score of 4 indicates above grade level mastery. This is a very different perspective than scoring a student based on what you expect them to be able to do at any given point during the year.